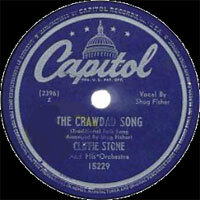 Chanteur US né Clifford Gilpin Snyder, le 1er Mars 1917 à Stockton (Californie), Cliffie Stone devient à partir de 1946, le responsable de la section Country chez Capitol Records. Il signa Skeets Mc Donald, Merle Travis, Tex Williams, Tommy Collins, Ferlin Husky et il s'occupa également de la carrière de "Tennessee" Ernie Ford. Cliffie était également chef d'orchestre et chanteur, ses musiciens comprenaient des grands de la Country comme Merril E.Moore (pi), Billy Strange (gt) et Speedy West (st). Cliffie est décédé le 17 Janvier 1998. 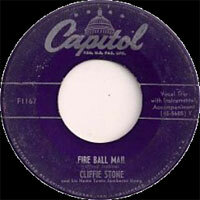 A native of California, Cliffie Stone was born Clifford Gilpin Snyder in Stockton on March 1, 1917. The son of entertainer, comedy star, and banjo picker Herman the Hermit, Stone was known for his struggle to bring California's country & western music into favor in post-World War II America. He began playing bass in big bands with Freddie Slack and Anson Weeks as well as with other bands around Hollywood and Pasadena, but it was his work on radio stations KFUD and KFWB that brought him respect. 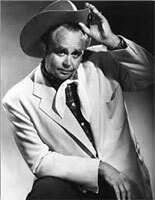 Shows such as Covered Wagon Jubilee and Lucky Stars, broadcast out of Los Angeles, allowed him to show off his numerous skills. Working as a DJ, comedian, performer, and host, Stone won fame doing 28 radio shows a week between 1943 and 1947. As a featured performer on the Hollywood Barn Dance, he made a place for himself in country music history. In 1946 he accepted a position with Capitol Records, who were gearing up for the still as yet undefined Bakersfield movement. An A&R executive with Capitol for 20 years, Stone discovered "Tennessee" Ernie Ford, whom he managed from 1947 to 1957, Molly Bee, Hank Thompson, and others who were flocking to L.A. to record. In spite of his success at Capitol, Stone was best remembered for his radio work. 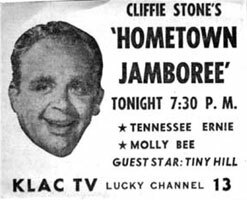 His show on Pasadena radio station KXLA, Dinner Bell Roundup, was a daily variety presentation that brought large numbers of country & western entertainers into the homes of his listeners. In 1944 the show picked up and moved to El Monte. The new location brought with it a new name, Hometown Jamboree. Recording six albums of his own he earned co-writing credits on hits "Divorce Me C.O.D.," "So Round, So Firm, So Fully Packed," and in 1947, "Silver Stars, Purple Sage, Eyes of Blue." 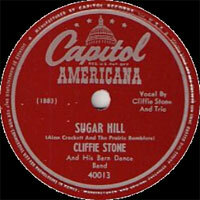 He recorded with various versions of his own band, including Cliffie Stone & His Orchestra, Cliffie Stone & His Barn Dance Band, as well as Cliffie Stone's Country Hombres. 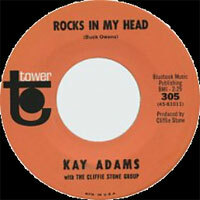 Concentrating on the business side of things, the 1960s saw Stone's publishing company, Central Songs, flourish. He even headed up a label, Granite, for a time. The father of Curtis Stone, one of the founding members of Highway 101, Stone wrote several books, including Everything You Always Wanted to Know About Songwriting but Didn't Know Who to Ask, published in 1991. He died of a heart attack on January 17, 1998. 1945 78 t. BEL-TONE E-0259 (US) . 1945 78 t. BEL-TONE E-0260 (US) . 11/1945 78 t. BEL-TONE E-0261 (US) . 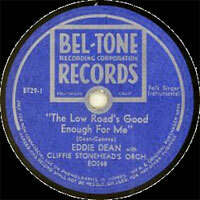 11/1945 78 t. BEL-TONE E-0262 (US) . 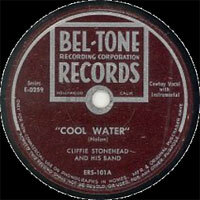 02/1946 78 t. BEL-TONE E-0263 (US) . 02/1946 78 t. BEL-TONE E-0264 (US) . 1946 78 t. BEL-TONE E-0267 (US) . 1946 78 t. BEL-TONE E-0268 (US) . 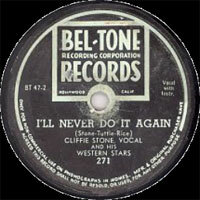 1946 78 t. BEL-TONE 271 (US) . 1946 78 t. BEL-TONE 277 (US) . 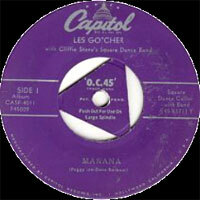 02/1947 78 t. CAPITOL 354 (US) . 03/1947 78 t. CAPITOL 378 (US) . 03/1947 78 t. CAPITOL 20098 (US) . 03/1947 78 t. CAPITOL 20099 (US) . 03/1947 78 t. CAPITOL 20100 (US) . 03/1947 78 t. CAPITOL 20101 (US) . 07/1947 78 t. CAPITOL AMERICANA A 40013 (US) . 09/1947 78 t. CAPITOL AMERICANA A 40041 (US) . 12/1947 78 t. CAPITOL AMERICANA 40064 (US) . 02/1948 78 t. CAPITOL AMERICANA 40083 (US) . 03/1948 78 t. CAPITOL AMERICANA 40096 (US) . 09/1948 78 t. CAPITOL 15108 (US) . 09/1948 78 t. CAPITOL 15157 (US) . 11/1948 78 t. CAPITOL 15205 (US) . 11/1948 78 t. CAPITOL 15229 (US) . 12/1948 78 t. CAPITOL 15316 (US) . 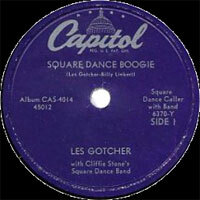 01/1949 78 t. CAPITOL 15362 (US) . 04/1949 78 t. CAPITOL 40146 (US) . 04/1949 78 t. CAPITOL 40147 (US) . 04/1949 78 t. CAPITOL 40148 (US) . 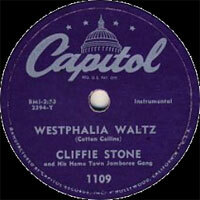 04/1949 78 t. CAPITOL 40149 (US) . 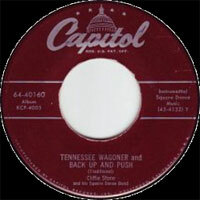 04/1949 78 t. CAPITOL 40150 (US) . 05/1949 78 t. CAPITOL 40160 (US) . 05/1949 78 t. CAPITOL 40161 (US) . 05/1949 78 t. CAPITOL 40162 (US) . 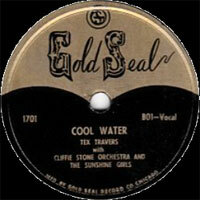 12/1949 78 t. CAPITOL 40167 (US) . 07/1949 78 t. CAPITOL 37-40170 (US) . 07/1949 78 t. CAPITOL 40190 (US) . 07/1949 78 t. CAPITOL 57-40191 (US) . 07/1949 78 t. CAPITOL 40192 (US) . 08/1949 78 t. CAPITOL 40193 (US) . 08/1949 78 t. CAPITOL 40196 (US) . 08/1949 78 t. CAPITOL 40197 (US) . 08/1949 78 t. CAPITOL 40198 (US) . 08/1949 78 t. CAPITOL 57-40207 (US) . 12/1949 78 t. CAPITOL 57-40265 (US) . 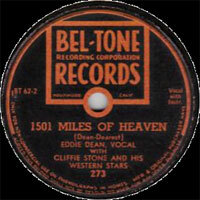 DISC 3 : Eddie DEAN with Cliffie Stone Orchestra : 1501 Miles Of Heaven / Cry, Cry, Cry! 02/1950 SP CAPITOL F877 (US) . 04/1950 SP CAPITOL F953 (US) . 05/1950 SP CAPITOL F986 (US) . 07/1950 SP CAPITOL F1109 (US) . 08/1950 SP CAPITOL F1167 (US) . 10/1950 SP CAPITOL F1265 (US) . 11/1950 SP CAPITOL F1275 (US) . 1950 SP CAPITOL 7-45009 (US) . 1950 SP CAPITOL 7-45010 (US) . 1950 SP CAPITOL 7-45011 (US) . 1950 SP CAPITOL 7-45012 (US) . 1950 SP CAPITOL 7-45013 (US) . 01/1951 SP CAPITOL F1354 (US) . 03/1951 SP CAPITOL F1406 (US) . 06/1951 SP CAPITOL F1496 (US) . 06/1951 SP CAPITOL F1606 (US) . 10/1951 SP CAPITOL F1834 (US) . 1951 78 t. CAPITOL 34-40147 (US) . 1951 78 t. CAPITOL 34-40148 (US) . 02/1952 SP CAPITOL F1960 (US) . 1952 SP CAPITOL 6F-45024 (US) . 11/1952 SP CAPITOL F2291 (US) . 02/1953 SP CAPITOL F2362 (US) . 03/1953 SP CAPITOL F2407 (US) . 06/1953 SP CAPITOL F2497 (US) . 07/1953 SP CAPITOL F2571 (US) . 02/1955 SP CAPITOL F3039 (US) . 05/1955 SP CAPITOL F3131 (US) . 09/1955 SP CAPITOL F3244 (US) . 01/1956 SP CAPITOL F3323 (US) . 03/1956 SP CAPITOL F3373 (US) . 11/1956 SP CAPITOL F3585 (US) . 08/1958 SP CAPITOL F4044 (US) . 11/1958 SP CAPITOL F4079 (US) . 02/1959 SP CAPITOL F4141 (US) . 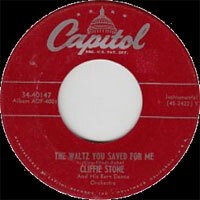 11/1964 SP CAPITOL 5292 (US) . 09/1967 SP Tower 361 (US) . 07/1968 SP CAPITOL 2243 (US) . 08/1969 SP CAPITOL 2596 (US) . 08/1969 SP CAPITOL 2597 (US) .